Russia’s newly appointed prosecutor-general of Crimea, Natalia Poklonskaya, has set the internet’s heart a-flutter after a video of her first press conference went viral on YouTube. Online users have bizarrely disregarded the fact that she holds a controversial position under President Vladimir Putin’s controlling government, instead labelling her ‘cute and hot’ and quickly creating memes and anime drawings of her. 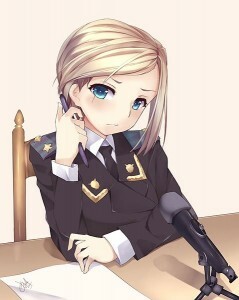 Poklonskaya has been an even bigger hit in Japan, with an enormous Japanese fan-base forming over the prosecutor-general due to her apparent anime-like features. However, the memes have arguably made light of the disasters in Europe, and have diminished her governing authority by drawing her as an adorable and wide-eyed ‘kawaii’ character. The internet sensation is a fascinating change of pace for the Russia-Ukraine crisis, the love-struck internet users saturating the online world with good-humoured appreciation of the 33-year-old’s striking looks, rather than berating Russia for its annexing of Crimea. The Crimea prosecutor, however, is upholding her serious political position as she assists Putin’s administration of troops into Ukraine. Perhaps young Japanese boys should remember that before doodling her name in their notebooks. This entry was posted in News, World and tagged Crimea, News, russia, world, wtf. Bookmark the permalink.